A wide-ranging account of events in American history, as briefly reported and commented on by a plethora of eyewitnesses—from the Aztec-Spanish confrontation in 1519 to the rise of the aerospace industry and Silicon Valley in the 1990s. 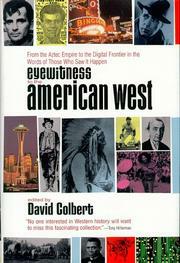 Editor Colbert (Eyewitness to America, 1997, not reviewed) has mined letters, diaries, interviews, and public writings to collect more than 150 short essays by contemporary observers of every period of American history. Colbert contends that Americans went to the West for many reasons: they were angry or dissatisfied, they needed to escape creditors, they wanted adventure, they were seeking religious freedom, they wanted to make a quick buck, to be their own boss, to become a landowner, miner, businessman, or missionary. You name it. The frontier has always stood for freedom in the American imagination, even as the frontier itself shifted: “West” could mean Rhode Island back in 1636 when Roger Williams left the Massachusetts colony to gain religious freedom. Some of the eyewitnesses—like Washington, Jefferson, Davy Crockett, Sam Houston, and the travelers Oscar Wilde and Rudyard Kiplingñwere famous or became so, but many were obscure figures who had the good luck to be standing in the right place at the right time or were simply good storytellers. Great events like the 1906 San Francisco earthquake, the attack on Pearl Harbor, and the upheavals in the US during WWII are covered, as are lesser-known episodes such the great earthquake of 1811 (which briefly reversed the flow of the Mississippi River) or the history of the Mormon settlements. A good introduction: Colbert gives us quick-moving, multi-themed snapshots of US history and Americana that educates, entertains, and more than makes up in breadth what it lacks in depth. These colorful historical hors d‘oeuvres may help to create an appetite for more complete main courses in American history for both students and general readers.